Homeschool geography has certainly changed over the years. Advanced tools make it possible to use maps in more ways than I could have imagined. The importance of maps in the modern world can not be overstated. From business and marketing, to national security, reaching people groups for Jesus Christ and even the ability to find a nearby Chipotle, having skills in modern geography will be essential for our children. 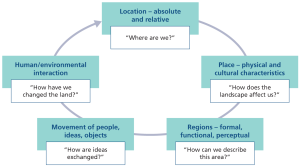 Geography- No longer only a study of static landmarks and boundaries, today's geography using the Five Themes of Geography, acknowledges interaction and change in geography. For me, the five themes approach is a wonderfully unifying way to study God's people and God's lands. 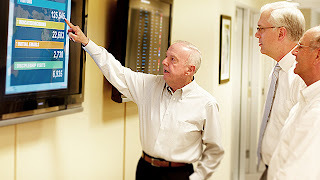 Google Earth-not only a cool tool to play around with, Google Earth has become very important for the many fields which rely on geographic data. From government agencies, business, academia and missions, knowing how to use, interpret and develop Google Earth maps will be an important skill for homeschool graduates to posses. Google Earth for Educators makes the study of homeschool geography very exciting and cutting-edge. Google's Geo Education site adds even more Google features to Google Earth such as Google Maps, Google Sky and Sketch Up to help educators, including homeschoolers, teach their children how to learn and create using Google Earth and related products as tools. Lesson plans are also available along with tips on how to use the various features for education. Real time maps-Understanding and developing real-time maps is an exciting field of study for homeschool geography. For example, Global Media Outreach, an Internet evangelism ministry founded by Campus Crusade for Christ, provides us with real-time reports of website visitors giving their lives to Jesus Christ all around the globe. I find visiting the Global Media Outreach Map so encouraging! The spirit of God is truly moving through all the earth and thanks to modern technology, the data are available for the world to see. Maps and Missions-exciting frontiers! WorldMap.org through their World Missions Atlas Project provides free of charge maps that feature missions information on them. Some of these maps are downloadable. I have downloaded several and they provide very encouraging statistics about missions work and are educational. The Joshua Project provides interactive world maps that include population data and vital statistics on the status of unreached people groups. You can even download an app or get a daily e-mail with a mini-map of the location of an unreached people group. WonderMaps- We purchased this innovative software. No need to run and copy maps all the time! Involves a one-time purchase that can be instantly downloaded to your computer. Includes Bible maps and other historical maps as well as modern maps. Modern geography is a very exciting field of study indeed!